Not only will we form your Montana LLC, we provide asset protection strategies through business formations in all 50 States. We can form multiple layer LLCs in Montana and whatever state you reside in to help reduce your liability exposure. PSRV.com is the oldest incorporation and registered agent website on the web. Prestige Services RV has been online since May 22nd 1991. 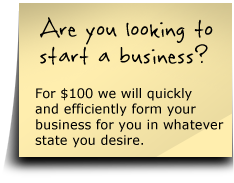 We charge $100 to form your LLC in Montana or any state. We charge $135 a year for the registered agent services in whatever state we form a LLC or corporation in. We charge $125 an hour for asset protection strategy planning services. The average complex strategy is planned in about 4-5 hours. Alternatively, if you are only looking for a registered agent in states other than Montana, we recommend the following firm as a registered agent.